I went home yesterday and immediately the smell of something burning hit my nostrils. My inner alarm spiked up- what’s wrong? Mrs. H (My host mother) is an incredible cook, there is no way she would burn something. I walked down to the kitchen and found her cutting up bananas, setting them into beautiful circle on pie plates. And beside her, sitting there in glory- was what I thought was burning. Dark brown liquid circled the bottom of the pan, and as I got closer the smell intensified. It was burnt, but it was also sweet; like those rainy days when you can smell both the stale of earth and crisp of wet grass. 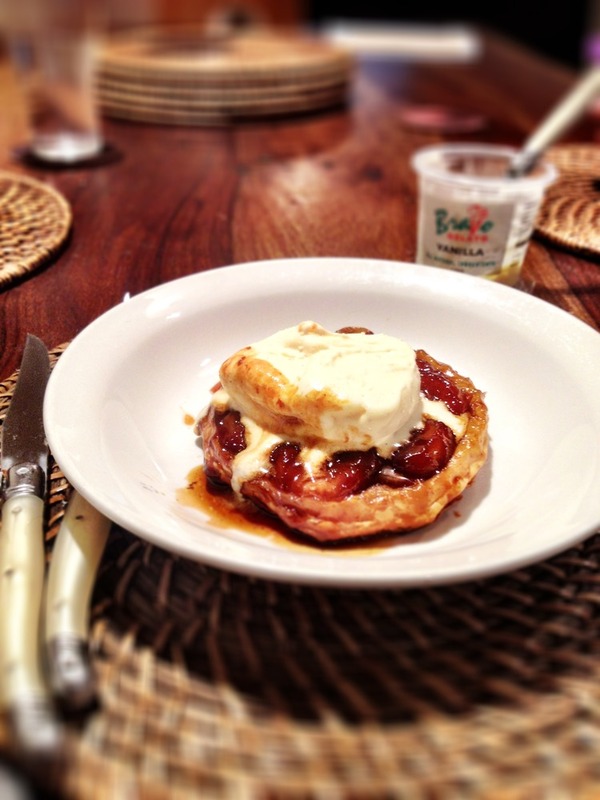 “Ever heard of Tarte Tatin Dee?” she asked. I nodded with excitement. She drizzled the caramel on top of the banana, hugging those yellow fluffs like blanket. I always thought french food is complicated and difficult, but Mrs. H explained to me that Tarte Tatin is just basically upside down Tart, which the fruit are covered in caramel (or how Wikipedia said it would be “caramelized in butter and sugar”). And it doesn’t have to be Apple Tarte Tartin! We could use bananas, pears, and other fruits. then I asked why she used pie plate rather than a pan. Mrs. H then enclosed the pie plate with pastry- sealed it real good and sent them to hot oven. Later that night we ate the Banana Tarte Tartin as a dessert, sizzling hot with oozing caramel and a spoon of vanilla gelato. I look around and realized a funny recognition; the deep brown of banana and caramel with pure white from the gelato-was a match with Mrs. H house, with their white cupboards and smooth wooden floors. You know what it smells like?